Ruth Grant puts out books for display at the Wheeler Taft Abbett library branch. If you’ve got library fines, now’s the time to settle up. 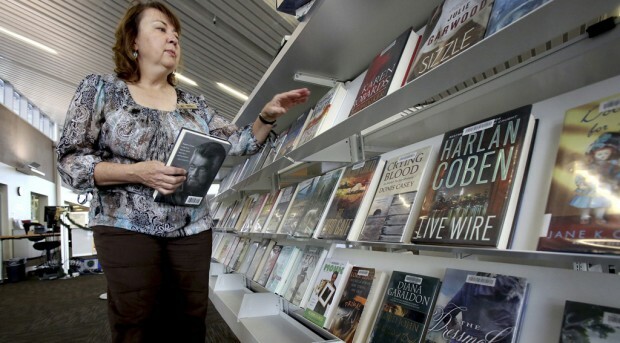 From Monday, April 15 to Tuesday, April 30, the Pima County Public Library’s Food for Fines program will give you the opportunity to donate one nonperishable food item for every dollar you owe in overdue fines. For example, if you owe $3 in late fees, bring three cans of food and your fines will be waived. There's no dollar limit. The food will be donated to the Community Food Bank of Southern Arizona and various local food banks for outlying areas of the county, says Michelle Simon, the deputy director of support services for Pima County Public Library. "The Community Food Bank has a great need, and this is a great opportunity for people to take care of their fines and help out the community at the same time," Simon says. Although this isn't the first time the library has done a Food for Fines initiative, it hasn't done so in several years, Simon adds. If you don't have any fines, you can still donate food. (Here's a list of the most needed foods). Bring any nonperishable items — nothing expired, damaged, open, in a glass container, etc. — to the front desk of your nearest branch library, and library staff will take care of waiving the applicable fines on your account. This only works for overdue fines, by the way. You'll still owe money for any fees for lost or damaged items. Simon tells us that about 80,000 library users in the county have fines on their accounts. Of those, about 54,000 owe more than $5, meaning they cannot borrow any items. The library offers a three-day grace period for due items and charges no fines for kids and teen materials. "We want people to come in and use our libraries in every way possible and fines just place an artificial barrier on being able to do that," Simon says. It's a second chance at success. When summer comes and the kids get bored, it can be brutal.